That includes beauty and health accessories (sunscreen and lots of earplugs, oddly enough), fashion (rain ponchos, wide-brimmed hats, headbands, sunglasses), camping (portable fans, card and board games) and tech goods (cameras, portable chargers, lots of batteries). All the goods were expressly approved by Coachella organizers. 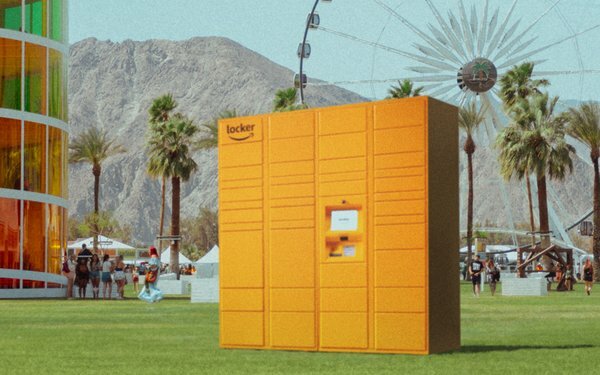 “Combined with the first-ever Amazon Lockers located inside the festival grounds, we are helping attendees spend less time worrying about packing and more time enjoying the experience of a lifetime that is Coachella, " stated Patrick Supanc, Amazon worldwide director of lockers and pickup. Amazon Lockers otherwise dot the map in 900 locations across the U.S., giving consumers an alternative place to pick up goods. Not only is this a Coachella first, it’s apparently the first time Amazon has created a store for an event, or set up a temporary Lockers post anywhere. Customers can have items shipped to Coachella for delivery starting April 11 — but Amazon says orders placed by noon, Pacific time, on festival days will receive same-day delivery at no cost. Though Amazon’s storefront is just virtual, YSL Beauty has created a real pop-up store en route on Route 111 near Cathedral City, the road most people will use to get to the venue. It really did pop up. The spot was just a vacant lot of desert sand, but will turn into something that looks like a gas station, with pink pumps and vending machines that will dispense YSL products. American Express has been involved with Coachella for several years, and this year it offers perks to members who sign up via Coachella’s app. Those include access to the Amex members club on the grounds, a free ride on the Coachella ferris wheel, and a $10 credit for the first $10 spent with a vendor.